The CH Throttle and Fighterstick are two individual components and so came boxed seperately. The packing was secure and robust so there was no problem with the sticks themselves. With them was CH’s control software and their USB cables. In the previous article I noted that one of the only (but common) complaints about the CH sticks was they’re bland in appearance. They really weren’t kidding. They’re the Volvo of the joystick world; boxy, but good. CH’s included instructions were pretty simplistic (“1) Plug everything in. 2) Good job, we’re out of here.”) but Windows 8.1 detected everything without a problem. Again, as they’re two separate devices they both attach via individual USB cables (unlike my old Saitek X52 which linked together and then connected to the computer via a single USB). I quickly looked at the devices in the Metro device manager and all the various buttons and axis worked perfectly. Now to give them a test. 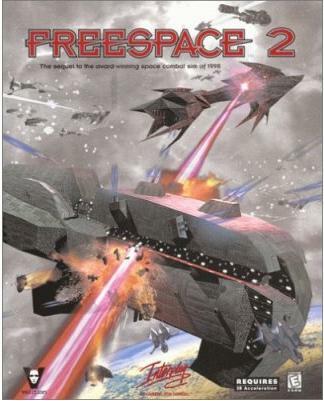 There’s been a bit of a dearth of recent space-sims and I didn’t want to invest 20+ hrs learning how to turn my landing lights on in a flight-sim so I had to revert to the classics; Freespace 2, with the Open Freespace community modifications. The best space dogfighting game ever? This lead to me getting stuck into CH’s control software. Some old games only recognise one joystick device attached to the system so CH’s control software allows you to create a single ‘virtual’ stick merging all the axis and buttons from your two devices (apparently, it will also merge a rudder system if you have one too). The manual was comprehensive but ambiguous so I promptly gave up and just mucked about with the software until I got it working. It didn’t take too long; while the UI on the software looks like it was written by Noah it was fairly logical how it hangs together. I’ve had 20+ years in IT though so byzantine interfaces come with the territory; Your Mileage May Vary. The joystick is not a ‘ball-joint’ type stick. Instead it registers movement on two axis at the same time. You definitely feel something when it translates from one axis to another (like if you full hard left, then push to top-left). It doesn’t affect the precision at all (there’s no resistance to the translation) but it’s different to my previous HOTAS (the X52). The throttle moves on one plane, it doesn’t ‘arc’ as it moves like you see many throttles doing (the grip is the same distance from the base no matter its throttle position). The weight seems about right; the base didn’t shift but it wasn’t unwieldy to move when I needed it to. While the joystick has a wide ‘throw’ and moves quite far it’s a bit stiffer than my old X52. It seems to be a good middle-ground between resistance and precision. Speaking of the precision the CH Fighterstick is a joy to use; the joystick is very responsive and tactile. It’s both smooth and exact. The wide range of movement meant I could control the ship in Freespace accurately with ease. There are 30+ buttons though many of them are positions on hat switches (ie, a four position hat counts as 4 buttons). Buttons have a solid feel and the hats are easily switched between their cardinal positions without ‘slushiness’. The 2nd button on the top of the stick is quite hard to reach if you’re gripping the stick in an traditional way; that may be because the stick is designed for use in a lower position (between your legs as you sit) which I’ve not had a chance to test. So TLDR version? 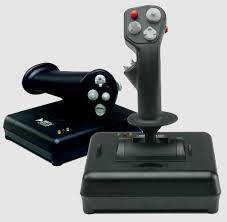 The HOTAS set looks bland (at best) but is a joy to use. There are loads of hats, buttons and axis so you’ll have no problems playing any game fully with your Hands On Stick and Throttle. It’s a massive upgrade to my old X52 both in feel and precision. Roll on Elite : Dangerous! I second everything you’ve said. I’ve been using the CH FighterStick, the Throttle, and the Pedals for about 20 years. While I have some complaints about the latter two, all are working like new after all these years. One comment about the Ch Control Manager; at one time it served valuable purposes but all it’s calibration features are better handled by the modern Windows OS, and Dawson’s FSUIP4 does advanced things (like fine tuning your controllers which is something to avoid unless, like me, you’re a flight simmer addict) much better. Also, using Control Manager can result in difficult to find and/or correct analomies. I think that even CH implies that users should avoid using program. The documentation for both Control Manager and FSUIPC4 set records that rival Microsoft’s “help” for user unfriendliness and obtuseness. Thanks for the comment. I’m still really happy with my CH sticks; their main use is still the occasional huge binge of Elite Dangerous though they’ve worked well for Freespace 2 as well. I have an ED profile which works well enough though I’ve had the occasional nightmare with it. I’ll have a look at the alternatives; it’d be nice not having to wrestle with the interface any more!